Ancient and modern devotees alike know Demeter to be a complex Goddess. As demonstrated by the poetry, essays, short fiction, and artwork collected in this anthology, she is a Goddess of many guises. Some devotees see her as an aspect of the Great Goddess, the source of all creation. For others, She is part of a fluid trinity, encompassing the phases of a woman’s life and the cycles of the year. Some experience Demeter as identical to the Roman Ceres, while still others consider them distinct entities. Some honor her as the Mistress of Good Green Growing Things, Lady of Herbs and Fruit, Queen of Flowers and Bees, She Who Bears the Golden Scythe, The Great Sow who taught us the use and preservation of seeds and who continues to bless our farms and gardens. Others experience her as the Law-Giver, whose gifts not only allowed humans to gather and thrive, but also necessitated the creation of customs and laws to ensure right behavior and the survival of civilization. For still other devotees, She is The Great Mother, The Destroyer, The Black Mare, Dark with Rage, Bringer of the Fallow Season, Mother of the Maiden who holds the world hostage until her daughter is returned. And for still others She is the Giver of the Mysteries, Overseer of Initiations, The Purifying One whose rites reveal secret truths and promise a blessed afterlife. She is all of these, and so much more. She is Demeter, Goddess most worthy of our devotion. Potnia can be purchased in paperback format through Amazon, and through Barnes and Noble. All of the proceeds from Potnia – as well as many of the other volumes in the Bibliotheca Alexandrina series – will be used to help promote the revival of the worship of the Greek and Egyptian Gods, with a portion of the proceeds given to a worthy charitable organization in their name. 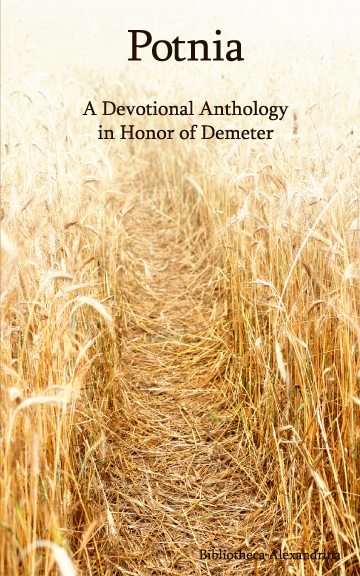 So, not only will you be getting a wonderful book about the modern worship of the Queen of the Harvest – but your money will be going to do good work and help the revival of ancient polytheistic religions. ATTENTION Librarians, Teachers and Retailers: Potnia is also available at reduced cost for academic institutions, lending libraries (public and private), and retailers. Check our online store, or email baeditor@gmail.com with any questions.